Martin Garage Doors of Nevada is accredited by the Institute for Door Education & Accreditation (IDEA). Martin installers and technicians are certified by the same organization. On the commercial side of things, Martin installers must also have other certifications including welding. A certified garage door technician must have a great deal of skill and experience in welding which is no easy matter. 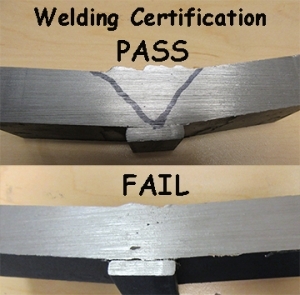 The “V” line in the photo marks the end of the metal and the beginning of the weld. Anything inside the V line is the welded steel joining these steel bars. The top sample passed the certification. The lower one did not (see pock marks).